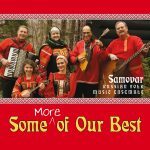 According to one Internet rating system, Samovar was tied with “Greatest Hits of Doris Day” for 26,000th place in CD sales in 2005. Available for purchase from iTunes. Available for purchase from iTunes and CDbaby.com. 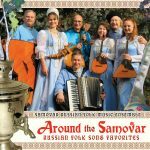 “Around the Samovar” is another hour-long set from the Russian folk music ensemble in the Washington, DC area that takes its name from the heated metal container traditionally used to heat and boil water in Russia, as well as in other locations. 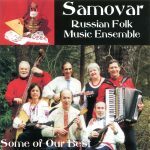 The heated water in a samovar is usually used for making tea, but the band says that their music is also enjoyable with something stronger too. 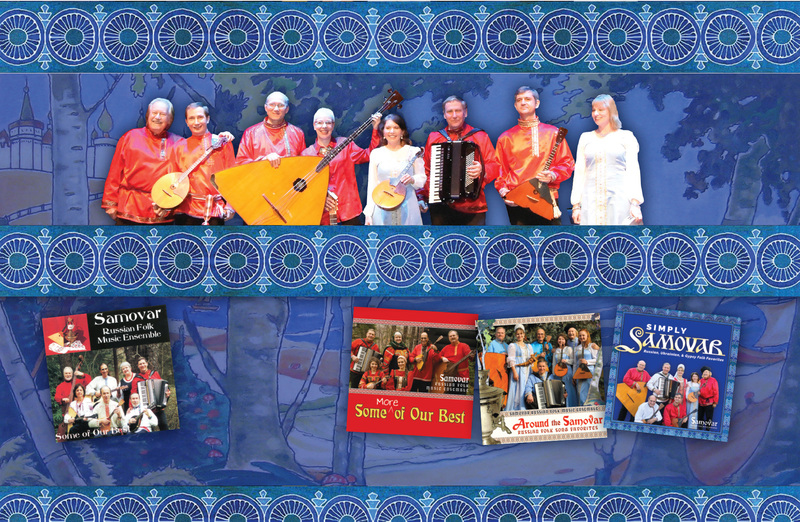 Antique samovars are often displayed for their beautiful workmanship, and the music of this eight-member folk music ensemble draws strongly from the traditional canon of favorite Russian, Ukrainian, and Roma (Gypsy) melodies. The most recognizable song is “Ey Ukhnem (Song of the Volga Boatmen)” which is sung by barge pullers on the river. With robust baritone voice, Nikita Wells calls to the others to heave, heave, heave. Most listeners will also immediately recognize “Ochi Chernyye (Dark Eyes),” a most famous minor-keyed Gypsy song that tells of love, sorrow, anguish and ruin. The two women vocalists on the project (Olga Rines and Anya Titova) commonly sing about love and rejection. Both are song carriers who are preserving messages and themes of their traditional musical heritage. Songs are driven by feelings of the heart, but there are also references to the mountains, trees, garden, and stars. As on their previous album, these natural elements calm one’s heart or serve as parties in lyrical conversations that question or provide advice. We also hear many lively songs and dances, most played in fast and crisp fashion. When the “Hutsulka Kolomeyka” (Ukrainian Hutsul Dance) cues up at track ten, we express gratitude that this dance form is so very much alive and well in the Ukraine today. 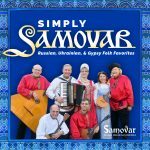 Samovar’s third album features some fine instrumentalists with Michael Nazaretz (accordion), Yelena Rector (prima domra), Rick Netherton (contrabass balalaika), Ilhan Izmirli (alto balalaika, guitar), and Katya Borodulina (prima balalaika). They display good control of tempo on tunes like “A Ya Lublyu Petrusia Polka (I Love Peter Polka).” At track 16, I was pleased to again hear their “Russian Dances” medley (that appeared on their first recording and was featured in the soundtrack of the movie, Driven to Kill). That medley includes the recognizable couple dances tunes “Korobushka” (Peddler’s Pack) and “Karapyet” (Russian Two-Step). While I wish they would’ve included the Arkan or Hopak (show-off tunes for male dancers) and perhaps even some guest fiddling on a few pieces, this album has plenty of material to get you leaping, twirling, and doing the kazatzkis along with their music.